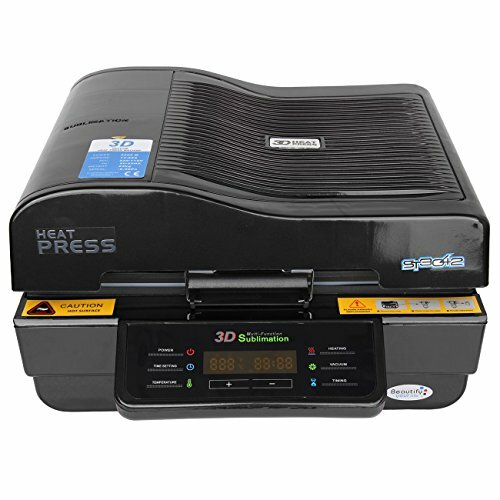 NOTE:This sublimation heat press machine does not recommended to transfer clothes. ●3D vaccum press is based on the newest sublimation technology. ●High efficient, it can imprint 12 mugs at one time. ●Multifuction, flat items and curved items are both ok.
● Safety, dual temperature control on software and hardware seperately and it'll power off within 15 minutes without any operation. ●High intelligent, you can only close the cover and no need to press any button when working. Printing Size: 11.8" x 16.53" x 4.33"
Product size:23.6" x 18.5" x 12.2"
Packing Size:27.5" x 24.8" x 16.1"
★Delicate & Clear--PanelTech Bump Heat Press printer has dots surface design, greatly improve the heat area, die-cast aluminium aloy heating, far infrared radiation coating, so that each point of the temperature of the furnace are uniform,to ensure that the image transfer more delicate and clear. ★Efficient --The PanelTech 3D Printer has a reactor design of 300x420x110mm capacity .It can put 12 mugs at one time, greatly improve work performance. ★Safety--The dual temperature control design of software and hardware can makes the machine to ensure safety.It will automatic shutdown if you do not operating in 5 mins. ★Environmental Friendly--The 3D Sublimation Printer Efficient is installed activated carbon air filter`,effectively to worry too much toxic and harmful gases generated in the transfer process,transported to the outdoors through the long catheter to ensure the helth and safety of the operating personnel.